‧A patented precision mechanical valve, hydraulic wheel locking system. 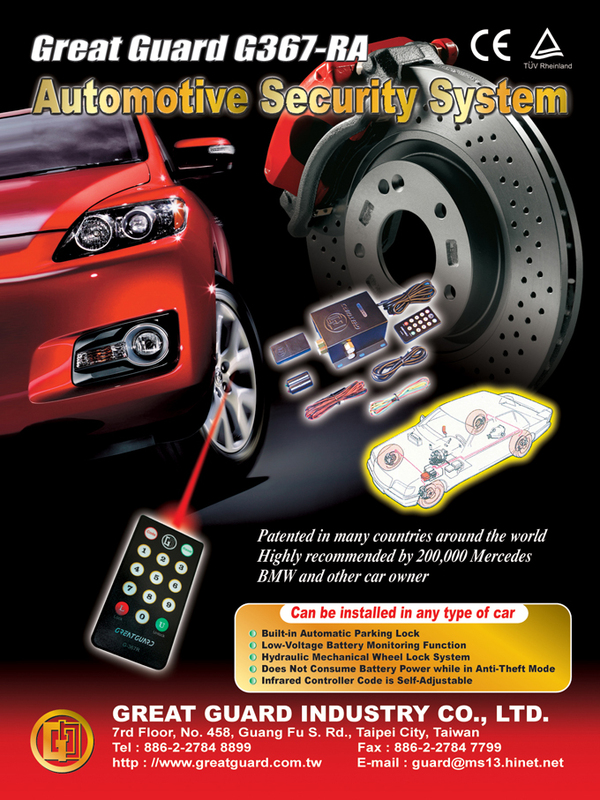 There are other functions: low car battery detection, brake system inspection…etc. The design of G-367R adopts Mechanism of Mechanical Motion. It is made up of a set of precision mechanical valve and micro-chip controlled system. By enter 4-digital code recognition system, the speed is decelerated through a reduction gear system and power is transformed to close or open the hydraulic valve. The pressure is accumulate or released by the valve causes the brake of the wheels to be hydraulically locked or released. Therefore, it is the most safety and effective ways of anti-theft function of Great Guard G-367R. The function of G-367R is totally based on the precision mechanical valve unit. The micro-chip system is used only for password recognition in order to unlock or lock the valve. There is no power consumption during the time of driving or in alert. Because the system is totally in mechanical of mechanism motion, therefore, it is the most primitive and safety design product. The mechanical valve of G-367R is installed between the pipes of master cylinder (brake system) and brake disk(or drum brake). Before starting the car, the mechanical valve is opened, the brake oil flows freely bidirectionally. Because it is no power supply of the micro-chip system during driving, owners don't have to worry of mechanical locked. During the alert, the mechanical valve is locked and no power is consumed. Due to check valve mechanism, once the thief breaks in the car and presses the brake pedal, the brake fluid is passed from the master cylinder through the valve to the brake disk, and the pressure accumulated and locked the wheels. There is no change of any original design of the car system, the accumulate pressure is totally depends on the primitive design of the brake system. 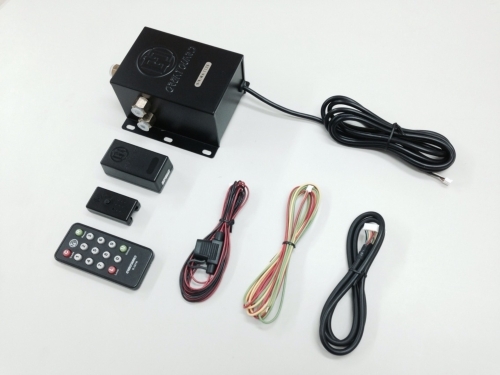 The micro-chip of G-367R works only during lock and unlock G-367 system (Car is in static state) for password recognition. The operating time is 3 seconds and the power is 0.4 A. The power is cut off during driving and in alert. The owner’s password is memorized permanently without any power. G-367R won the patented right in many countries all over the world. It has passed the severe test through Industry Technology and Research Institute (ITRI) and proved its excellent characteristic. It has won also CE and TUV approvals. During it was available in market for the passed tweenty-three years, it has been installed 100,000 sets just only for BMW and BENZ.